28 coins total. Outstanding way to start a coin collection. It's sealed in a cardboard display. 17 coins total. Outstanding way to start a coin collection. Type lot of 20 Philippine coins (U.S. and Republic) - Includes 1, 5, 10, 20, and 25 Centavos Pieces. NOT A REPRODUCTION OR REPRINT. BOOK IS NEW NEVER READ NOR SPINE BROKEN IN. This is a lot of 54 circulated Philippines 10 centavos coins from 1960, 1962, 1963, 1964 and 1966. RefID= WC70784. PHILIPPINES 1967 1 Peso. PHILIPPINES 1967. RefID= WC70993. 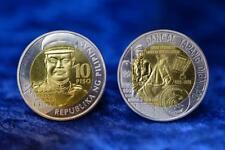 100th Anniversary Birth of Andres Bonifacio 1 Peso 26.73g. 38mm. PHILIPPINES 1963 1 Peso. PHILIPPINES 1963. Nine of the 66 are specific to the Pilipino series. The coins pictured are exactly the coins you will receive. This is part of the coinage promised by the United States to help get the native Philippine's to fight against the invading Japanese army in WWII. Virtually none of these exist in Original Gem White Uncirculated. 6 - 1992 25 sentimo. 6 - 1994 25 sentimo. 1992 & 1994 1 Piso. 6 - 1991 2 Piso. Copper Nickel 25 Sentimos KM 227. Aluminium Sentimo KM 224. Brass 5 Sentimos KM 225. Copper Nickel 10 Sentimos KM 226. KM#'s 163 and KM# 179. You grade these coins. Composition : Bronze. Variety of Dates. RefID= WC60448. PHILIPPINES 1928-M AE 1 Centavo. AE 1 Centavo. PHILIPPINES 1928-M.
RefID= WC70786. 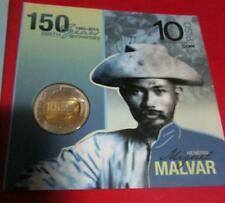 100th Anniversary Birth of Apolinario Mabini 1 Peso 26.63g. 38mm. PHILIPPINES 1964 1 Peso. PHILIPPINES 1964. RefID= WC74923. PHILIPPINES US Administration 1909-S AR Peso. PHILIPPINES US Administration 1909-S. 6800 University Ave. If the above item is a coin, when it is attributed or graded, every effort is made to be as accurate as possible; however, good people can differ. 3rd party graders in my experience are very inconsistent. RefID= WC60447. PHILIPPINES 1922 AE 1 Centavo. AE 1 Centavo. PHILIPPINES 1922. CIVITAS Galleries, Ltd. No exceptions. RefID= WC69473. PHILIPPINES 1933 M 1 Centavo. PHILIPPINES 1933 M. No exceptions. Coins are carded. 1 centavo 1944 km 179. You will receive 10 coins, circulated to uncirculated condition. coins included 25 sentimos: 1972 km 199, 1987 km 241.1. 50 sentimos 1993 km 242.3. 2 Phillipines Coins One 1 Centavo 1944 10 Sentimos 1980 Pilipinas Filipinas . 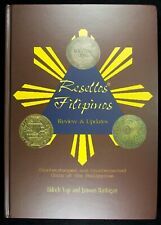 One 1 Centavo 1944 United States Of America 1" Filipinas Ten 10 Sentimos 1980 Ang Bagong Lipunan Bangko Sentral NG Pilipinas 1949 Republika NG Pilipinas Francisco Baltasar Shipped with USPS First Class Package. PHILIPPINES Alfonso XII 1880 AR 20 Centimos. AR 20 Centimos 5.06g. 23mm. Manila Mint. PHILIPPINES Alfonso XII 1880. No exceptions. Macau 1974 20P & Phil. 1967 1P (#492) Both BU Some Stains. RefID= WC70783. Centennial of the Birth of Aguinaldo 1 Piso 26.8g. 38mm. PHILIPPINES 1969 1 Piso. PHILIPPINES 1969. No exceptions. Therefore, we have made a series of rough estimates that will appear on the lot information. If the above item is a coin, when it is attributed or graded, every effort is made to be as accurate as possible; however, good people can differ. Therefore, we have made a series of rough estimates that will appear on the lot information. The are mostly 2 pictures for each item, front and back. If the above item is a coin, when it is attributed or graded, every effort is made to be as accurate as possible; however, good people can differ. 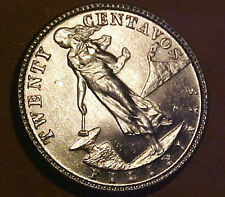 1994 ONE PISO COIN INFO We are collectors, not professional coin graders. The pictured coin is the exact one that you will receive. HIGHLY PROFESSIONAL! SUPER FAST. Well, Would Buy From Again!". : " item as advertised, great. SPECIFICATIONS FOR 1994 50 SENTIMOS 1992 ONE PISO COIN INFO We are collectors, not professional coin graders. The pictured coins are the exact ones that you will receive. Reverse: Pithecophaga (monkey eating eagle) attacking. SPECIFICATIONS FOR 50 SENTIMOS COINS We are collectors, not professional coin graders. The pictured coins are the exact ones that you will receive. Reverse: Pithecophaga (monkey eating eagle) attacking.